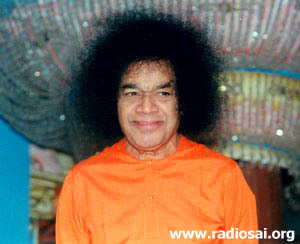 This is the transcription of the talk delivered by Sri B Arvind in the divine presence of Bhagawan Baba on the 29th of July 2005. Offering my Humble Pranaams at Bhagavan’s Lotus Feet. Beloved Bhagavan, esteemed elders, dear brothers and sisters. And there was a stunned silence. Brothers and sisters, we are all ready to suffer for God. We are all ready to undergo pain for God. 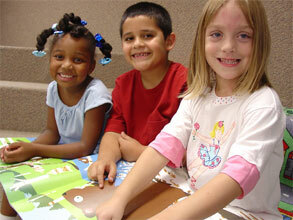 But are we ready to be cheerful for God? To be happy for God every moment of our lives? What is it that we want in our lives? We want to be happy every moment. And what is it that God wants from us? He wants us to be happy every moment. Then where is the problem? Why are we not happy every moment of our lives? This has been answered in various ways, in various scriptures, by various religions. And I feel that being in the Sathya Sai Institute of Higher Learning, this is the greatest gift we receive: the gift of this higher learning; learning how to be always happy. We are unhappy because of what people term Maya – ignorance; and we have the Jagad Guru, the Lord of Lords amongst us to help us overcome this. Talking about ignorance, or Maya, I am reminded of an interesting anecdote. Tvameva Saravam Mama Deva Deva. Though I could not see my Bhagavan with me always, I imagined that my Bhagavan is with me whether I eat my food, whether I sleep, whether I talk, whether I am in the classroom. I imagined that Bhagavan is with me and I would talk to Him. Anything I found uninteresting I would tell him, “Swami, this is not interesting for me.” Anything I found interesting, I would also tell Him. And so, this is how it went on. I imagined that my Bhagavan is always walking with me. Because this is what the Truth is: though we cannot see Him, though we cannot hear Him, He is always there. And so this went on everyday and I was happy. But then one day a small problem came up. I told Bhagavan, “Bhagavan, see this is the problem; it is not getting solved.” And I wrote it down in a letter to Him and I came to the Mandir. And I was so sure that when Bhagavan came, He would take the letter from me. So I was sitting there, and as Bhagavan passed by I held out the letter. He merely passed by without even looking at me. At that moment I felt crushed. I felt that all that I was doing was nothing but hallucination! Is it really true that Bhagavan is with me or am I merely imagining Him? Are these all my hallucinations? I was shaken. I said, “Then whom do I tell this?” It was something which I didn’t want to tell anybody and I said, “I cannot even tell it to Bhagavan. Is it that I am alone in this world? Do I really have nobody?” And the next week was torture because I felt so lonely. I felt helpless. Then Bhagavan said, “No, no, no before you do anything you tell me. How can I do anything without telling you? So shall we go to the park?” I was surprised. As we were walking towards the park, Bhagavan said, “Arvind, I am scared to walk on this side of the road. Can I walk on that side?” When we reached the park, Bhagavan said, “You sit here and block me, because you see those people there? If they see me they will come and talk to me. Then whom will you talk with?” And at this moment I was shocked. In the dream I said, “Bhagavan, how do you know all this?” At that time Bhagavan put on His angry face. He said, “Until four days ago you used to tell me everything. You used to share and we used to be so happy. For four days now you have been so silent, I don’t know why.” And the dream ended there. Bhagavan is always with us but we may not be able to feel Him. If the radio set is out of order, can you blame the transmitting tower? No. The radio waves are always in the air. The tuning system is broken, so we were not able to tune in and we blame the tower! This is what happens. It once happened that Bhagavan came and mentioned to a senior teacher here, “So many people are writing letters.” Then the teacher said, “Bhagavan, maybe they have some emergency – that’s why.” Bhagavan then looked at Him and said: “What? Once they come under Me do they have any emergencies? The very moment they come to Me there is no emergency in their lives!” And this is the greatest benefit we have. We have all come under Sai. Let me narrate one incident. We always think that we have come to Puttaparthi. We have come via rail, road, or airplane to Swami. Let me mention an incident that will make us all realize how fortunate we are. "Your Time Has Not Yet Come"
Listening to this Mr. Mandalay was stunned. Next the Sanyasi said when Bhagavan visited North India He went to the ashram of Swami Shivananda. He said, “I was a disciple of Swami Shivananda. Swami Shivananda was my Mentor, my Guide, my Guru, my Teacher. 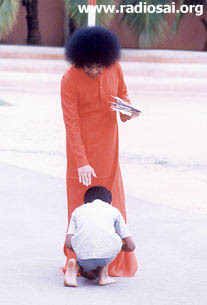 When Bhagavan came, he ran and prostrated to him and spent one day with Bhagavan. After that the Sanyasi said, “Whenever I meditated in my third eye region I could always see Swami.” But he never made any effort to come to Puttaparthi. 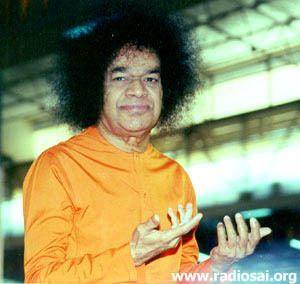 One day, while traveling to Madras, He saw a photo of Bhagavan and he enquired about Him. 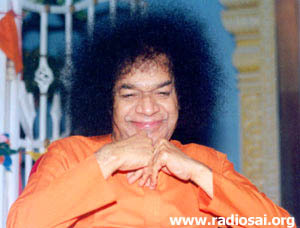 Some people told him that Swami is there at Puttaparthi in Andhra Pradesh. He was overjoyed listening to this. 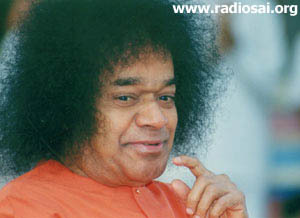 Brothers and sisters, let us never forget what a great opportunity it is just to sit and look at Bhagavan. Sages and saints of yore have prayed for ages and they just get a glimpse. We get Darshan for hours together. It’s time that we realize our opportunity. I would like to conclude with one thing an elder brother told me. I asked him, “Brother, what do you think we should do so that our lives will not be a waste?” He told me something which seemed very radical. But I would love to share it with everyone because it is the truth. Each of our lives should enable Bhagavan to point out and say, “If you are to see the quality of My Mission, look at the life of this devotee. Look at the life of that student.” And our life must stand as testimony to Bhagavan’s Mission. Because in this life there is nothing, I stress nothing more important or of any greater value than loving Bhagavan, loving God, with all one’s heart. Dear Reader, did this transcription of a student's talk help you in anyway? Would you like more of such transcriptions? Please let us know at [email protected] Please mention your name and country when you write to us. Thank you for your time.